Linux is the most popular operating system which provides several powerful administrative tools and utilities that help us to manage the systems effectively. With the Linux command line feature we can access any system remotely and securely. This is the reason Linux is mostly used as Servers. The other thing is its UPTIME. Linux can be run continuously without reboot for years. 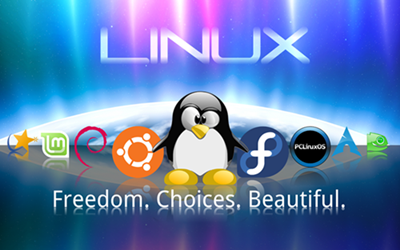 Linux OS has many distributor. Some are the following. 1- Ubuntu: Currently the most popular distributor. The most user-friendly version for Linux newbies. 2 Fedora: The next most popular distributor is Red Hat’s free distributor that includes a powerful desktop GUI based on Gnome 3 but there are also various spins of it that use different desktops – such as KDE, LXDE, XFCE. It is often amongst the first to include new technology and is strong on security. It has strong command line feature and is more reliable and ideally suited to the slightly more adventurous user. 3- Linux Mint: It is another user friendly version of Linux, based on the Ubuntu core or can described as “an improved Ubuntu”. 4- CentOS: It is completely based on Red Hat Enterprise Linux. It is mostly used for servers. 5- Red Hat: It is the best server distribution. But it is not free; you have to pay for it. If an organization doesn’t mind spending dollars on purchasing the red-hat support, this is no 1 recommendation to any organization who runs mission critical applications. 6- Open SUSE: It is the foundation for Novell’s SUSE Linux Enterprise Desktop and SUSE Linux Enterprise Server products. Open SUSE rates a “medium” on difficulty level. 7- Debian: Debian is known as one of the most well-tested and bug-free distributor. It serves as the foundation for Ubuntu, most view Debian as a distro best-suited for those experienced with Linux. Debian has a relatively slow release cycle, with stable ones coming out every one to three years. 8- Mandrive: Mandriva is notable for its cutting-edge software, excellent administration suite and 64-bit edition. It recently restructured, with the result that some view the future of its community version as uncertain.